Reflect over the speech of as-Sīrafī and understand that the affair revolves around holding fast to the path of Salafiyyah, and in speaking the truth, acting upon it and remaining steadfast. It was due to this that the imāms of Sunnah would praise a person and elevate his rank. 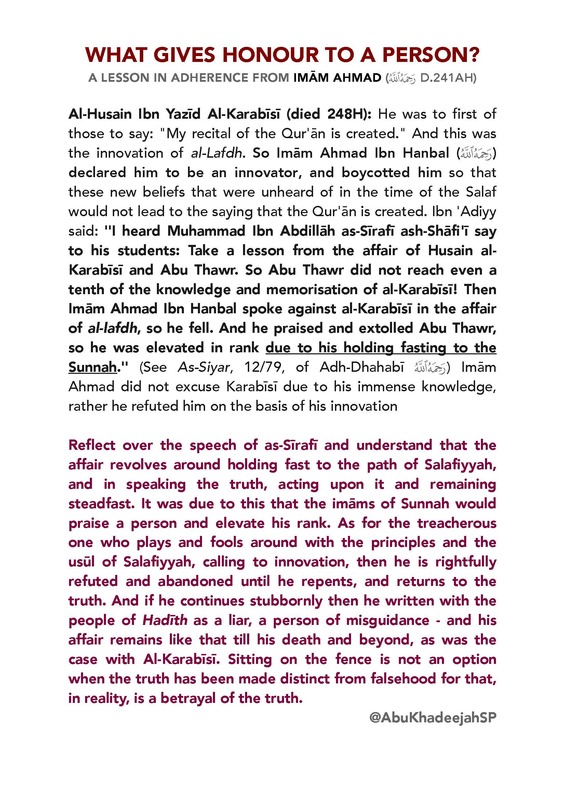 As for the treacherous one who plays and fools around with the principles and the usūl of Salafiyyah, calling to innovation, then he is rightfully refuted and abandoned until he repents, and returns to the truth. And if he continues stubbornly then he written with the people of Hadīth as a liar, a person of misguidance – and his affair remains like that till his death and beyond, as was the case with Al-Karabīsī. Sitting on the fence is not an option when the truth has been made distinct from falsehood for that, in reality, is a betrayal of the truth.